Okay, I’ll admit it. I have a mild obsession with pattern paper. Well, more than mild, but honestly, there are so many pretty papers on the market and they are premiered twice a year and released more often than that. I can’t help myself. Yet, I’m trying. 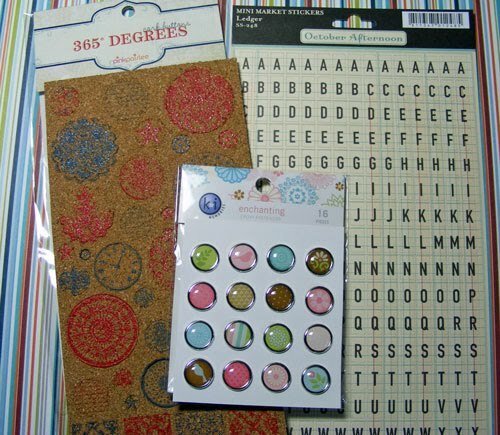 After CHA (Craft and Hobby Association) show in January, I dogged the Two Peas website scanning all the new releases and putting favorites into my wish list. What I really wanted though were the October Afternoon papers so last week when they finally came in, I ordered. Apparently, I’m not the only one who fell in love with these designs. They are hot, hot products. But before the October Afternoon stuff arrived, I’d piled up quite a stack of papers in my wish list. So to keep my little addiction under control, I limited my paper purchases to half my order total. That meant I was buying mostly the ones I craved the most. The rest of the order had to be embellishments, tools, stamps, anything but paper! Funny thing is much as I love the paper I received this week, I think my favorite things from the order are in that other half – embellishments. KI Memories Enchanting Epoxy brads: I selected these because I thought they would compliment the Sweet Pea paper pack I’d bought a couple months ago from Stampin’ Up! And they do – in both design and color. The colors are a little lighter than SU! but they do work. I’d highly recommend these brads if you have that paper pack from the Winter mini. October Afternoon Mini Market stickers: In Kristina Pick’s videos, Kristina (founder of Two Peas) got me interested in small stickers. There are lots of times I want to spell out “The” “And” and other small words along with my die cut or chipboard titles. I love the ledger background of these stickers. They could be used with anything! Pink Paislee cork buttons: Honestly, these aren’t really buttons. I picked them because they were different and that was part of the point of making myself not buy so much pattern paper – to get some cool, unique stuff to play with. What I like most about these is the back of the package gives you suggestions on how to use them and embellish them further. Putting instructions or ideas on the back of a package is just good business. Why doesn’t everyone do that? The backdrop for the photo above is one of the individual papers I purchased from My Mind's Eye Little Robot series. I also got the paper with the gear images and have started cutting it up. This is another thing I'd recommend for an SU! collection. This line goes beautifully with several SU! colors like Not Quite Navy, Tangerine Tango, Kiwi Kiss and Going Gray. Oops, I forgot, I wasn't going to talk about paper, was I?